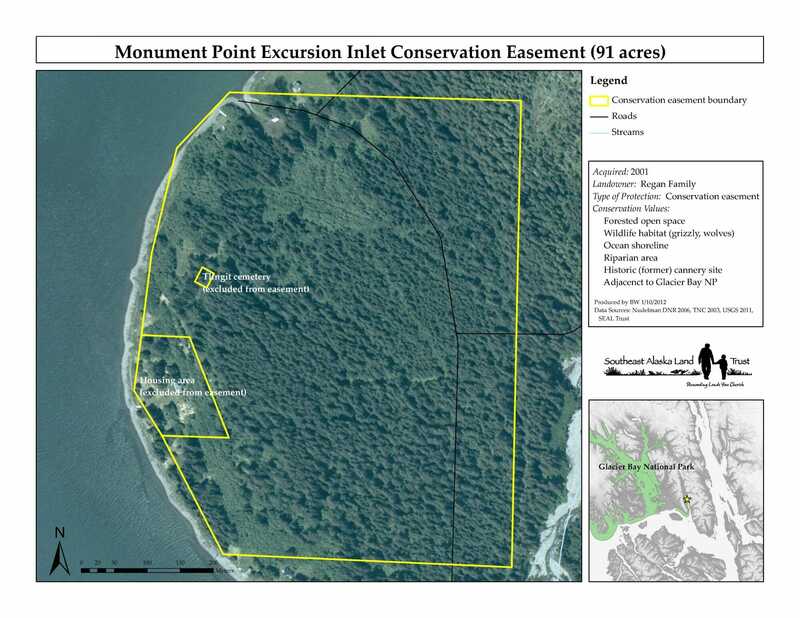 In 2001, the Regan Family donated the Monument Point Conservation Easement to SEAL Trust to permanently protect the property as conservation land. 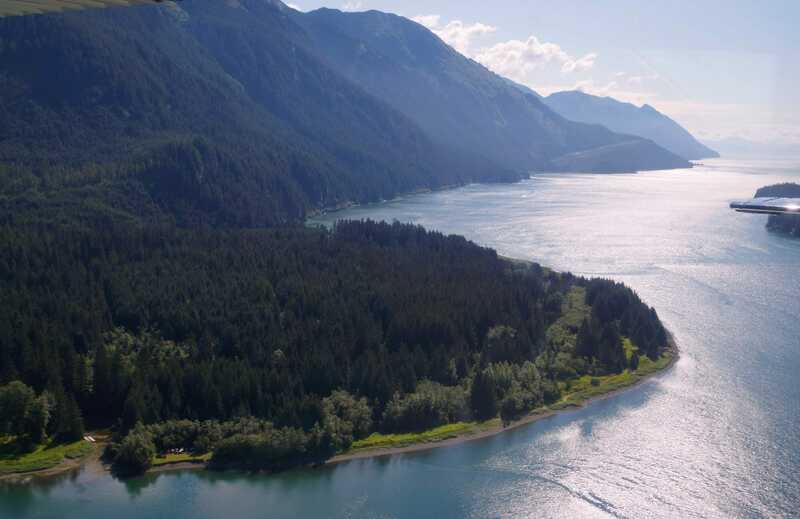 The conservation easement ensures that the property will remain in its natural and scenic condition for the benefit of wildlife and for the enjoyment of residents and visitors to Excursion Inlet. The majority of this property sits upon an alluvial fan at the mouth of Devil’s Creek, and features a 225-foot stretch of shoreline. It lies just half a mile across the inlet from Glacier Bay National Park and Preserve. The property features a Sitka spruce and western hemlock forest. Forest density ranges from fairly large Sitka spruce, especially along the back property line, to well-established second-growth Sitka spruce and western hemlock in the core area of the property. The underbrush is thick on Monument Point, and includes blueberry, high-bush cranberry, wild currant, Pacific red alder, devil’s club, cow parsnip, and several varieties of ferns. This thick underbrush supports black bear, Sitka black-tailed deer, and red squirrel. Other wildlife utilizing the property include brown bear, wolf, coyote, moose, mink, and otter. Monument Point has significant historic value, as the remnants of a cannery operated by Pacific American Fisheries are located on the property. The facility was built in 1908 and operated from 1909 until 1931, when financial hardship forced the company to close the cannery. The cannery’s closure has been attributed to a variety of factors, including the Great Depression, changing immigration policies affecting the labor force, and frequent dock-destroying ice flows that caused the surrounding area to be labelled Icy Straits. Two early plats of the cannery property exist, dated 1909 and 1931. The 1909 plat depicts a large cannery building and warehouse extending out over the tidewater, as well as inland structures including residences, a stable, and 14 small buildings referred to as an “Indian Village.” The 1931 plat portrays an increased level of infrastructure development with 63 structures, including the main cannery building, associated warehouses, a cold storage, a hospital, a church, a radio communication facility, and numerous residences. It is likely that the 1909 plat documented buildings as they actually existed at the time, whereas the 1931 plat was a blueprint for planned expansion and some of the structures depicted were never actually built. Though Pacific American Fisheries sold the property in 1964, remnants of the cannery are still visible, including old pilings that supported the main cannery buildings and docks, a few pieces of rusting cannery equipment on the beach, and the remnants of an ice house. Four known periods of logging activity occurred on the property during the 1900’s. The first period of tree removal took place to clear the land for the upland cannery buildings, yielding enough wood to power the cannery’s boilers for the first several years of operation. It is thought that the hundreds of pilings used to support the cannery area came from this original land clearing. Records suggest a second logging period took place in the 1940’s by the U.S. Army, which operated a sawmill on the northwest corner of the property. During this time, the U.S. Army created a tidally influenced log pond adjacent to the sawmill operation, which still exists today. The third period of logging took place in the mid 1960’s for the sale of timber. The final period of logging activity in the area took place in the 1970’s when the Forest Service maintained a camp on the property while it clear-cut land located east of Monument Point. This logging operation included use of an airstrip, log storage area, a logging camp, and a road through the property.